'The Wiz' is more than an award-winning Broadway musical. Its evolution into a feature film and many revivals emerged to become a reflection of African-American culture. 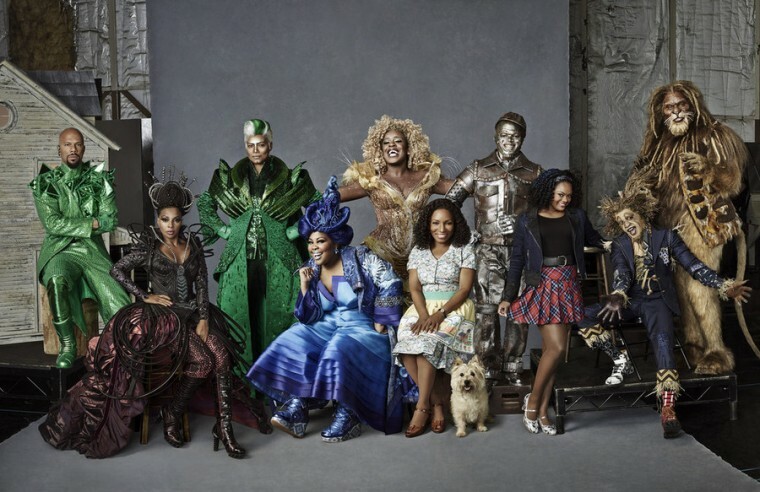 As this franchise gets revisited during tonight's "The Wiz Live!" special on NBC, it would behoove us to recognize its contributions to entertainment and the influence of black performance art on pop culture 40 years later. The tale of how 'The Wiz' went from an ambitious idea to almost not happening to becoming a seven Tony Award-winning Broadway hit is a microcosm of the perseverance of black people dreams in America. The brainchild of former disc jockey Ken Harper, The Wiz aimed to remix “The Wonderful Wizard of Oz” from traditional Broadway play to a live stage performance with a Motown feel. In his presentation to Fox, Harper exhibited the foresight to promote the appeal that a musical inspired by black performing art could succeed in theaters across the country. In a 1975 interview with Playbill, he recounted his sales pitch to Fox, saying "You pick up Billboard or Cashbox" any week, and what you’ll find is that five of the Top Ten songs on the charts are black. The message was clear. In this country, at this time, a certain kind of black music, the 'Motown Sound' sells, and it sells to everyone, black and white." The show opened on October 21, 1974 at the Morris A. Mechanic Theatre in Baltimore and debuted on Broadway on January 5th, 1975. Despite a opening night fraught with technical issues and suggestions to quit while they were ahead, "The Wiz, The Super Soul Musical 'Wonderful Wizard of Oz"' received standing ovations and curtain calls. Mixed reviews be damned, Fox continued to support financially. Harper and his team utilized the funds to assemble a media blitz, trading airtime on radio for free tickets to shows and conducting as many interviews with the cast as possible. Three years later brought the film adaptation, which wasn’t without its share of controversy. Stephanie Mills, the lead on Broadway was tapped to reprise her role as Dorothy, but a last minute power play from Diana Ross had her inserted into the role. Although the movie received critical disdain, it did not prevent it from attaining cult classic status. The Broadway production amassed a collection of talented individuals who, when given the platform, could deliver excellent performances. Although young and relative unknowns like Stephanie Mills (16, Dorothy) and Hinton Battle (18, Scarecrow) led the cast, they proved to be excellent options. This cast also made history as George Faison became the first African-American choreographer to win a Tony. Also of note, the cast had familiar names as extras, most notable Phylicia Rashad (née Ayers-Allen). The film version of 'The Wiz' formed a mosaic of black excellence prevalent in 1978 and beyond. The ensemble included Diana Ross, Nipsey Russell, Mabel King, Richard Pryor, Lena Horne, and a young up and coming musician named Michael Jackson. Unlike films where popular actors are cast in films hoping that name recognition will translate to commercial success, The Wiz concocted a harmonious mix of talent greater than the sum of its parts. For anyone watching in 2015, the familiar faces resonate based upon more recent accomplishments. Fans of “The Cosby Show,” “A Different World,” comedy and Michael Jackson/Jackson 5 music will embrace any of these characters with a breath of familiarity reserved when reminiscing on fond memories of friends or relatives. Prominent African-American actors whom you can identify with throughout your life. This cast had established icons and future legends, who would be cemented in black culture from that point forward. Fans always profess their adoration for The Wiz based on a variety of reasons. Jermaine Spradley, Executive Editor at Bleacher Report saw The Wiz as a family affair: “I remember 'The Wiz,' and 'The Wizard of Oz,' just being a sort of rite of passage in our house. They were the kind of films we watched once a year, together.”, he said. “The idea of watching them more than once in a particular year would be kind of like celebrating Christmas in December and then again in July." One theme consistent for African Americans in 1975 pertains to the absence of a consistent platform for African-American artists to flourish. Ken Harper’s vigilance with bringing his play to fruition and getting commitment for financial backing notwithstanding, it’s proven difficult to attain a somewhat equal representation for people of color in mainstream entertainment. A trend that continues today. Recent findings from the "2015 Hollywood Diversity Report" conducted by the Ralph J. Bunche Center for African American Studies at UCLA demonstrate that minorities comprise only 17% of lead actors, 18% of directors and 12% of film writers. “The only thing that separates women of color from anyone else is opportunity. You cannot win an Emmy for roles that are simply not there.” You can’t succeed in a game that you are hindered from playing. Similar to integration in professional sports, black people can create their own platforms to showcase their talent, and can utilize these platforms to eventually get the chance to excel among their peers regardless of color. Black culture routinely shows its indefatigable disposition over the course of time towards overcoming obstacles. Entertainment is no different. This is why we revere our stars and the accomplishments of productions like 'The Wiz.' It declared to the entertainment world that black people will find the money and the outlets to tell these stories and perform. If the lanes are filled, they’ll create their own. As we prepare to see a new spin on a classic tale, we are reminded that despite advances in diversity for entertainment and society, the core tenants of prejudice and limited opportunity permeate throughout Hollywood. Here’s to another 40 years of families congregating to watch great shows over the holidays, together. The Wiz, Live! airs Thursday, December 3rd at 8 PM on NBC. Jeff J. provides his unique digital media services to a variety of outlets. Jeff hosts the web show Gamer’s Life, and created the ADHD Show Podcast. He covers the NYC entertainment scene for The YBF, and serves as the Social Media Editor for SingleBlackMale.org. Whether it's behind the scenes or in front of the screen, Jeff strives to entertain, educate and interact with audiences of all sizes and demographics. Jeff has fun being him, as we all should!